We start this tour with the Dutch and British colonialism of Cape Town. The tour includes visits to the District Six Museum and the Slave Lodge. We showcase why Cape Town is so diverse compared to the other provinces in South Africa and we showcase the Cuisine that is special to the Cape community. You do get to taste this wonderful food at lunch time. We then drive to the townships where you have an opportunity to walk with a local tour guide through the township. You will meet the locals, communicate with them. You will also meet the communities that were forcible removed in the early years by the apartheid government. We will visit a few entrepreneurs in the townships that are self sustainable. This tour make you see how communities can strive to live together and make things work for themselves even in difficult times. 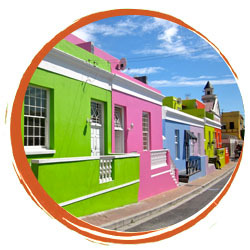 This tour is conducted by Guides who grew up in the Townships and the experience is done with passion and knowledge. Travel with Rene | Powered by Mantra & WordPress.